You may not re-upload this mod to this site or any other site without my permission. You may not upload any mod which uses assets from this one without my permission. My textures are modified directly from those created by Bethesda. This mod is a texture hack. 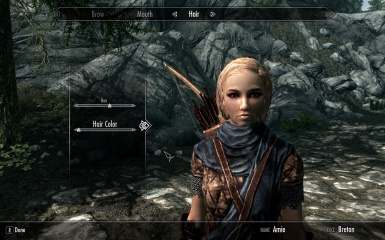 It replaces the eyebrow textures with modified versions which will vary more noticeably with the color of the character's hair. Dark hair will still result in dark eyebrows, but blond hair will result in blond eyebrows, and auburn hair with auburn eyebrows, et cetera, whereas the original files were so dark that it was hard to see any difference between black and blond. In v. 1.0, I have maintained a tone that makes eyebrows slightly darker than hair. 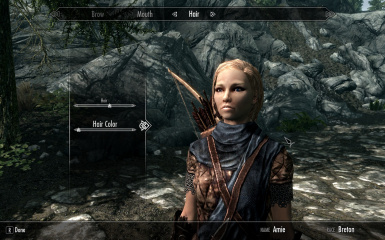 If you prefer a more manicured look for female characters, a more sculpted set of brows based on my textures is now packaged with Caliente's body replacer, which you can find here (NSFW) https://www.nexusmods.com/skyrim/mods/2666?tab=description. If you don't want the body replacer, just use my mod as a guide for what you're looking for and extract only those files from Caliente's mod. For male brows, I think that my mod is still your only option.